Avocados (Persea gratissima, Persea Americana) are technically a fruit, though many think of them as vegetables. They come from a subtropical tree, originating in Mexico and South America. The tree is a member of the Laurel (Lauraceae) family and there are about 500 varieties, which produce fruits ranging from small and egg-like to heavy pears. Avocados are nutritious and full of beautiful oil. The Aztecs believed the avocado had aphrodisiac qualities because of their shape. The name avocado is derived from the Mexican name ahuacatl, which is a shortening of the Aztec name ahuacacuahatl. Avocado butter is produced from the fruit’s flesh. This rich vegetable butter melts very easily, making it an excellent ingredient in our luxury bath melts and massage bars. Our You’ve Been Mangoed bath melt creates a luxurious bath in which avocado butter soothes and conditions the skin. It rehydrates the skin at the same time, giving you a unique bath-time experience. It is recommended for fine lines and wrinkles and said to help protect skin from ultraviolet rays. 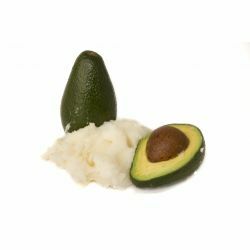 Unruly or dry hair will benefit from avocado butter, as it is rich, nourishing and softening. We use it in our Curly Wurly shampoo to help add strength and shine to the hair. We use avocado butter in our Each Peach (And Two’s a Pair) massage bar because it melts on contact with the skin. The effect is hydrating and moisturising.